The announcement of Bitcoin futures trading by NYSE’s operator ICE has failed to significantly impact the markets. What will happen next? The crypto world had cheered the prospects of Bitcoin futures trading last year. However, Bitcoin ( BTC) prices topped out just as Chicago Board Options Exchange (CBOE) futures began trading. Though not directly responsible for the fall, the futures traders have had an effect on the price, as they shorted the cryptocurrency when it was closer to its lifetime highs. Therefore, it was no surprise that the markets were not enthused after the Intercontinental Exchange (ICE) announced that it will launch physically-delivered BTC futures contracts this November. Though these products are likely to attract institutional investors, we are yet to see any concrete evidence of the institutions actively investing large sums into digital currencies. 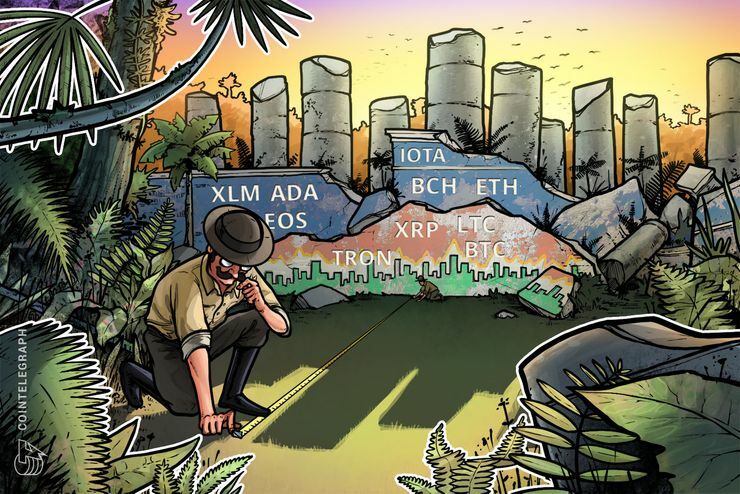 Until that happens, the cryptocurrencies might remain in a range, suitable only for short-term trading. Investors will have to be patient with their purchases because this consolidation might continue for a few more weeks. Let’s see what do the charts forecast? Bitcoin broke down of the descending channel on August 4 and fell below the downtrend line of the descending triangle, which is a bearish sign. For the past two days, the bulls have been trying to hold the 50-day SMA. This is the final support, below which a retest of the $6,000 level is probable. Even if the bulls defend the 50-day SMA, a rally will be an uphill battle because the BTC/USD pair will face a stiff resistance at $7,250 and above that at $7,750. The 50-day SMA is flat, but the 20-day EMA has turned down. This shows weakness in the short-term. Unless the bulls force a quick recovery, the probability of a fall to $6,000 will increase. There is no clear trend now, hence it’s best to remain on the sidelines. We shall wait for a new buy setup to form before recommending any fresh long positions. Though Ethereum dipped below the support of $404.99 several times over the past three days, it always managed to close (UTC time frame) above it. However, the bulls could not push the prices higher, as the pair continues to trade near the support line. A tight consolidation at the bottom shows very weak demand from the bulls. Such a formation usually results in a breakdown. The declining moving averages and the RSI in the negative territory also point to a bearish move. The next stop on the downside is $358. Our bearish view will be invalidated if the ETH/USD pair sustains above $425 for a couple of days. Ripple has successfully held on to the support at $0.4242 for the past six days. However, with both moving averages falling, the bears are attempting a breakdown once again. If the XRP/USD pair sustains below $0.4242, it can extend its fall to $0.37942 and thereafter to $0.32862. On the upside, the 20-day EMA and the 50-day SMA will continue to act as resistance. The only bullish sign on the chart is the positive divergence on the RSI. However, a trade cannot be taken on this signal alone, unless price also confirms a breakout. Hence, we are not recommending any trades on it. Bitcoin Cash broke down of the trendline on August 4 and failed to climb back above it on August 5. It can now slide to its next support at $669.2524. If this level also breaks, the next support zone is between $619.751 and $657.8. The moving averages, which had completed a bullish crossover just a few days back, have again turned down, completing a bearish crossover. This shows that the sellers are in command. On the upside, the BCH/USD pair will face a stiff resistance at the moving averages and above that at the downtrend line. The digital currency will turn positive if it breaks out of $935. We shall wait for the bulls to prop prices higher before suggesting any trades on it. The bulls have been defending the $6.8926 level for the past five days. The 20-day EMA, which had flattened a few days back, has again turned down. The RSI is also in the negative territory. This shows that the probability of a breakdown on EOS is high. The support on the downside is at $5.1 and below that at $4.3396. Any pullback from the current levels will face a stiff resistance at the 20-day EMA and above that at the 50-day SMA. The EOS/USD pair will turn positive only on a breakout and close above the $9.4456 level. Though the RSI is showing a positive divergence, we are yet to see sustained buying on the cryptocurrency. Therefore, we shall wait for a breakout of the range before proposing any long positions. Litecoin broke down of the range and the critical support at $74.074 on August 4, but quickly bounced back into the range on the next day. The recovery attempt by the bulls is facing a roadblock at the 20-day EMA. Currently, the LTC/USD pair has again descended to the support at $74.074. If the bears sustain below $74 for three days, the possibility of a fall to $57 will increase. As both moving averages are falling and the RSI is also in the negative territory, the path of least resistance is downwards. Our bearish view will be invalidated if the bulls push the prices above $91.146. Until then, it is best to remain on the sidelines. Cardano found some buying support close to $0.12 on August 4, but the bulls have failed to sustain above the $0.13 line. For the past four days, the price has been clutching to the $0.13 mark. A break below $0.12 can result in a retest of the June 29 low of $0.111843. On the upside, the bulls will face a stiff resistance at the moving averages and above it at the downtrend line. The 20-day EMA has turned down and the 50-day SMA is also trending lower. The RSI is also close in the negative territory. This shows that the bears are currently in advantage. We shall wait for the ADA/USD pair to break out of $0.181617 before recommending any buys. Stellar has been taking support at the 50-day SMA for the past two days. If the support breaks, the next support on the downside is $0.184. Though the 50-day SMA is flat, the 20-day EMA has turned down and the RSI is also in the negative territory. This shows that the sellers are at an advantage. Any recovery attempt will face resistance at the 20-day EMA. There is no trend in the XLM/USD pair, hence, it is better to wait for a few days and establish positions only when a strong buy pattern develops. There is a tussle between the bulls and the bears in the $0.9150 area. While the bulls bought into the dip on August 3, the bears defended the 20-day EMA and pushed the prices back below the support on August 4. On August 5, IOTA closed right at the support after a large range day. After three volatile days of trading, the IOTA/USD pair might enter a consolidation period between $0.7735 and $1.0269. A break below $0.7735 will resume the downtrend and can result in a fall to $0.666, followed by $0.5721. If the bulls succeed in pushing the prices above the downtrend line, a rally to $1.33 will be on the cards. We shall wait for a new buy setup to form before suggesting any trade on it. Tron has been trying to hold the support at $0.0281344 for the past two days, however, it has not been able to bounce back sharply. This shows a lack of demand at these levels. If the bulls don’t push the prices higher within the next couple of days, the probability of a breakdown below the support lines increases. The next target on the downside is the long-term support of $0.022806. Both moving averages are falling and the RSI is in the negative territory, hence, the bears are holding the advantage. Any recovery will face resistance at the downtrend line. The TRX/USD pair will show signs of life only after it sustains above $0.045.